Felt Up: Death And The Maid. In Mahattan. Lordy, kids, there has been NO GOOD GOSSIP lately! But lest you think I have abandoned ye all, here is some crapola that I scraped from the bottom of the non-news barrel. First up, J. Lo finally had her twins, a boy and a girl. Yippee. Somehow that ghoul Marc Anthony was able to impregnate her with his pasty zombie seed. Those poor kids are going to have it rough, being of mixed race: Half wampyre and half diva. I don't envy them, no matter how much ridonkulous opulence they are surrounded with their entire lives. The world has made tremendous advances, but it can still be cruel to the spawn of the undead and the untalented. Can you imagine what a nightmare patient J. Lo must be? I feel bad for the doctors and nurses and scented candle wranglers who had to be at her beck and call in the hospital, I really do. I don't mean to be ugly, but in her advanced pregnancy, J. Lo's face sort of resembles a tanner version of late-era Kathleen Turner. Have no fear, I'm sure she had all that puffiness sucked out during her Mend It Like Beckham and will be back to her over-the-top, non Turnerish self in no time. And we will have to endure endless photos in the tabloids of every pound dropped, every baby item purchased for months and months. Sigh! In other lame non-news, Aaron Carter got busted right here in the great state of Texas for pot possession. TMZ reports that the little bro of Nick Carter from The Backstreet Boys was pulled over on I-10 in Junction for speeding and the police searched his car and found 2 ounces of reefer inside! That's kind of a lot, right? 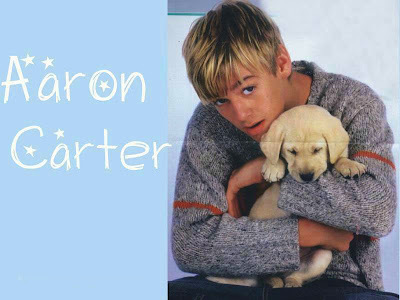 If I was Aaron Carter (or that puppy) I'd probably be pretty stoned most of the time myself, I have to admit. I don't know why anyone cares what happens to Aaron Carter, or any member of the Carter family, since they're not on a reality show anymore, but use this information in good health, dear readers. Here's hoping the celebs get up to some better hi-jinx next week! If you live in Texas, don't forget that early voting is ongoing until next Friday, Feb. 29th!